Online Shopping has grown leaps and bounds in India over past 5 years or so. Earlier, it was a rarity, but now eCommerce has touched every online citizen’s life, be it men or women of India, be it a person from Metro or a person from tier 2 city. Cashkaro.com, India’s leading cashback and coupon site has come out with some interesting statistics that bring out the uniqueness of Indian women and men shoppers. Probably when John Gray publishes another version of his best seller, “Men are from mars and Women are from Venus”, he must include these stats from the e-commerce industry. The online spending habits of each of the sexes are quite diverse and their shopping tastes differ hugely. 1 1. Do you like App only platforms? 2 2. What is your preferred mode of payment? 3 3. What are the categories you are wary of? 4 4. What is your average ticket size? 5 5. Whom do you primarily shop for? 6 6. What is your encouragement for shopping online? 1. Do you like App only platforms? For most women, it’s only the shopping experience that counts, whether it’s on APP or site, it doesn’t make much difference unless shopping through the App gives them more discount. Observing the rise in traffic from smartphones, Mynta declared to seal the deal on App only but the men haven’t embraced the change yet. 2. What is your preferred mode of payment? Debit cards are the most preferred for men while women prefer Cash on delivery (COD). Though women are quite decisive while shopping online, they’re still cautious while deciding to pay for it. COD for them is a safe option while men usually resort to paying right away and being done with it. Cashkaro also observed the rising payments happening from mobile wallet payment sites like Paytm which reportedly has 20% of online shoppers paying through it. 3. What are the categories you are wary of? For men, transacting on real estate sites is still a doubtful move. While women find buying jewelry online a very tricky deed. One similarity in this category is that both the categories are often skeptical about entering high value transactions online. 4. What is your average ticket size? The women lead this category with an average pocket of Rs.5,000 to Rs.10,000 while the men shop somewhere between Rs.2,000 to Rs.5,000. When it comes to examining the total value of purchases, women shell out more than men. 5. Whom do you primarily shop for? Women spend the most and mostly on themselves while the men however come out to the most generous spending more on their spouses than themselves. Looks like the women are cashing in on forgotten anniversaries, birthdays and other such occasions. Also shopping works way better than therapies for most women. 6. What is your encouragement for shopping online? Discounts seem to attract men to shop while for women, they stand grounded with the ever-lasting cashback offers and coupons. Women at any cost make time to shop anytime in the afternoon time and the 35% of their purchases happen in the noon, while men prefer to shop after 5pm. Shopping for gadgets and fashion rule the scene for women, while men are usually caught shopping for gadgets and travel bookings. Online recharge are most popular with both the genders and so it utility bill payments. Shopping and women are inseparable, as they say men buy but women shop! 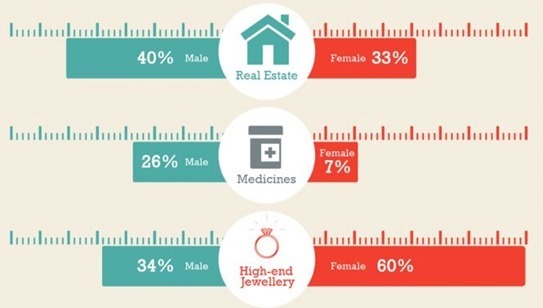 "Interesting Online Shopping Habits Of Indian Men & Women", 5 out of 5 based on 1 ratings. Soon, MasterCard Payment Authentication To Be Done By Your Selfies! Indian Ecommerce Will Become $33 Bn Market; eShoppers Grow At 33% Per Month! Online Shopping Diwali Impact: 91% More Transactions; 80% More Google Searches!